The PRATS are off to the last league game of the season, we started in Dorset and we finish here as well with a day out in Dorchester. With over 5000 miles already on the clock this trip will take us up to 5500, yes this is non-league footy played mostly by people who have to go to work. We don’t have the highest mileage either, poor old Bideford and King’s Lynn does considerably more. We will be starting early around 8:00pm and making our way to a Little Chef near Andover before continuing to the Wayland Sixpenny brewery between Salisbury and Blandford Forum. 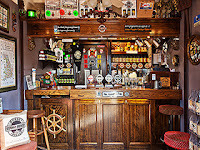 We’ll spend around an hour here sampling their finest ales before moving on to Dorchester, there is a decent cluster of pubs in the town centre, zoom in on the map to get a better indication. As you will see there aren’t any decent pubs really close to the ground, the Victoria Hotel is half a mile away and serves Ringwood ales. The same distance away is Brewhouse & Kitchen which is situated in Brewery Square, location of the former Eldridge Pope brewery. Fuggles still has a bottle of Thomas Hardy’s ale dated 1990. 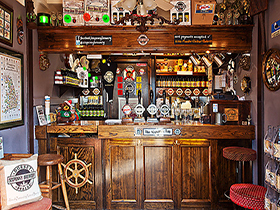 We went to one of these B&K pubs in Poole, very nice with a good selection of their own ales. 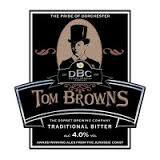 Dorset Brewery Company (DBC) tap is Tom Browns located at the top end of the town. You could easily have a good day out here on a pub stroll. The match could well be important with the Mighty Reds still harbouring hopes of a play-off spot; it will require all the planets in the solar system to be perfectly aligned whilst Pharp refrains from vacating for 24 hours prior to kick off. We may have a chance with the planets. On the way home, well it’s a long trip so it will depend on Parker, however, there is a beer festival at the Nags Head in Abingdon. It could be a timely stop off point. If all else fails we can always nip into the Towcester Mill for one last sup of the season.